No permission is given to copy, share, distribute, reproduce, post or print without written authorization. Contact PopArtDiva.Com for licensing information. 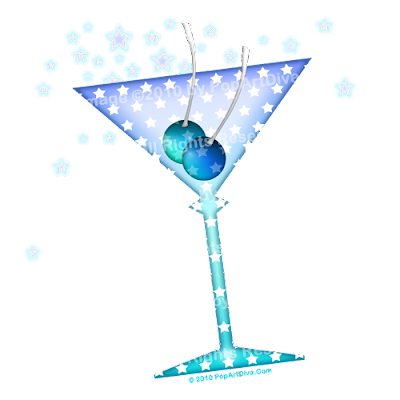 Blue Martini is the second in a series of Color Martinis that I've started. Earlier this month I finished Pink Martini and I'm going through the color scale starting with my favorite colors! I love turquoise and blues so Blue Martini was a natural for the second in the series. 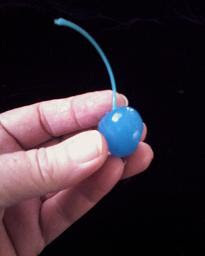 Of course, I would have colored them blue anyway - I did, after all, give you pink olives in my Pink Martini, didn't I! I'm keeping these simple - just the martini, the garnish and a few little sparkles of martini coming out of the glass. I plan to do a minimum in the series of four but hope to do eight - maybe a purple, a yellow, a green, a red and maybe a black and white one. I always work in series for licensing purposes - licensees like to do multiple product lines and they like options. Plus everyone has a favorite color so it works for my Martini Diva Boutique products as well. I love stars so that was my pattern on this one. I used polka dots on the Pink Martini and maybe I'll do hearts on a red one which would be perfect for Valentine's Day. Be sure to stop by The Martini Diva Boutique and check out the Blue Martini on Posters, T-shirts, Cups, Aprons, Customizable Business Cards, Note Cards and even some cool sneakers! They're perfect for your Happy Hour or as gifts for that cocktail loving friend.